May of 2009, FLASH member Matt Kirsch had an idea to make packages with food, toiletries and lists of clinics and shelters in the area. He brought them to socials and gave them to members to carry with them and hand out to someone needy. It's a very good gesture and I informally named it "two hands working" from the Ben Franklin Quote "two hands working do more than a million clasped in prayer". This week we had very low temperatures for South Florida (35 degrees). Being South Florida, we are not used to cold and the homeless find open areas to bed down, mostly without any shielding from the elements. The shelters fill up fast here in cool weather and with a cold front bearing down on us, FLASH made a plea on Facebook for donations to buy blankets, sleeping bags, socks and food. In less than 24 hours we had $340. Sports authority made us a great deal and I bought all the polar fleece blankets they had (30) and from thrift stores we found sleeping bags, blankets and coats, We also bought packages of socks and gloves. We added some food to hand out a meal with each set-up. We had enough stuff to help 45 people. Three of our members, Jarek Loovali, Susan Stoff and Ray Loukinen volunteered to look for people that did not get into the shelters. Unfortunately, they weren't that hard to find. I would have much rather they brought the stuff back because there were enough shelters. But they found them, many with very little to keep warm. The people were very grateful and appreciative. It was also very good for these volunteers. It is hard to do good for another and not feel good yourself. Ray Loukinen said "We only had about six "god bless you"s , I explained that "we are atheists, but what's important is that you don't freeze tonight"
FLASH members want to expand our efforts and we will field new ideas. While it is not our mission to cure homelessness, poverty and other social ills, we are humanists and can't resist the needs of others. FLASH also donates equipment and supplies to local schools in lower income areas. Our purposes are state/ /church issues, religion in schools, public image of non-believers and forming communities for them. Performing random acts of kindness is an idea that many atheists around the world support. Raising money is always tough, many times I rely on "begging" FLASH member's to support these efforts. I realize that homelessness is everywhere but if you can help other south Floridians become aware of our efforts, that would be a great plus. Also, FLASH likes to meet atheists from everywhere, so if you are visiting here, please contact us and attend one of our socials... it's fun. Submitted by RationalRespons... on Tue, 2011-04-05 20:11. Some of you have already noticed the big banner in the left sidebar (those of you who have adblock installed probably haven't) announcing that we're participating in DonorsChoose this year, the charity that takes your donation and directly hands them over to specific projects teachers have proposed. It's one way to try and compensate for the deplorable state of public education financing in our country. I'll be reminding you all a few more times in the future, but just keep it in mind — if you've got a few dollars to spare, pass them on to teachers and kids who really need them. Submitted by Sapient on Sun, 2010-10-03 14:43. Ella had a rough summer; she’d been throwing up every morning. At first, we thought it was anxiety from leaving her friends at school, moving, and knowing that she’d be starting at a new school in the fall. (She had a brief unrelated similar event in the past) – We immediately took her to the doctor, and had every test run – Blood tests, sonograms, they tested for celiacs, they thought it maybe acid reflux; we even saw a psychologist thinking it may be emotional. After 2 months of sleepless nights and countless appointments, one doctor said that the only other thing she could diagnose may be a brain tumor and suggested a CT scan. In denial we put it off for a week or so. Finally a family member said ‘Get that kid in for a CT scan.’ We all agreed – and that’s when we saw the mass in her brain. The next day we drove to oakland (an hour or so south of us) and came to see the neurosurgeons and had the MRI. The doctors gave her numerous hand/eye tests and said that everything checked out perfectly; if they hadn’t seen the MRI, they would have never made the diagnosis. She had a large tumor in the 4th ventricle resting against her brain stem, blocking spinal fluid. The doctors had Ella take a steroid for a week to reduce swelling, and last tuesday they performed brain surgery. The surgeons removed almost all of the tumor, leaving only microscopic cells that will hopefully be killed with radiation and chemotherapy. The doctors thought she’d be up and talking within a day or so, but did warn of us the risks and the remote chance of coma. Well, Ella is that rare case. The day after surgery, the doctors noticed a large blood clot forming and had to go back in for an emergency surgery. The next mornings scan showed there was still blood pooling, so they wentback in for a third surgery. She is currently in ICU, and may be there for weeks. She’s on a ventilator and monitors. She was more stable over the weekend, but still mostly in a coma. She was able to open her eyes a few times when asked, and wiggle her fingers and toes, but this morning she was not responding. This evening, however, she did open her eyes and move her arm. The doctors told us a few days ago that she had turned the corner, and now they say she is on the ‘wave of recovery’ sometimes up, sometimes down. It’s so hard to sit and watch and be so helpless. Ella is such a strong girl. It’s hard, but I must stay Hopeful and picture her pulling through this event and waking up so we can go through the steps to get her better together. All donations go to the Madden and Stewart families to off-set hotel, food and medical costs. Any amount helps! Submitted by Sapient on Wed, 2010-09-29 21:11. A letter against segregation finally delivered by well known atheists. and planned to walk his message from Chattanooga, Tn to Jackson, Ms, on April 23, 1963 he was shot in the head twice and killed. Several attempts to deliver this letter has resulted in nearly 700 people being arrested and beaten, some prisoned and fed crushed glass in their food and hit with electric cattle prods... the letter never made it to it's destination. On April 23, 2008 Ellen Johnson and others walked the original letter (given to us by Bill's widow) from Attalla, Alabama to Jackson, Mississippi, 320 miles in order to bring recognition to William Moore and all the Freedom walkers of 1963. I would like to thank the very nice people and Police in Alabama and Mississippi, your concern for our safety was greatly appreciated. We have come a long way since 1963. From wikipedia: Folk singer Phil Ochs wrote a song in tribute to William Moore that appears on the album A Toast to Those Who Are Gone. Another tribute song (in German) for William Moore was written by socialist German singer/songwriter Wolf Biermann. Starting April 23, 2008, Ellen Johnson and Ken Loukinen walked the 320 miles from Reese City, Alabama and delivered Bill Moore's original letter to Jackson, Miss. and Dr. Bob Zellner (one of the original Freedom walkers in 1963) attempted to present the letter to the current governor of Mississippi, Haley Barbour on May 6, 2008, but the Governor would not meet with them to accept the letter. Submitted by Rich_Rodriguez on Mon, 2009-10-26 14:38. Melinda Moree met plenty of naysayers who dismissed the prospects of a malaria vaccine. Then she encountered Bill Gates. No one had developed a human vaccine against a parasite like malaria before, and the monetary incentives simply did not exist for pharmaceutical companies to develop drugs targeted at poor children. Development would require cooperation among scientists, drug companies, health groups and international governments -- an alliance so large it didn't seem possible, she recalled someone telling Gates. "Of course it is," Gates countered, according to Moree, now director of the PATH Malaria Vaccine Initiative in Seattle, which along with other groups has received nearly $500 million from the Bill and Melinda Gates Foundation to develop, test, manufacture and eventually distribute a malarial vaccine. "There's something about vision and belief that these things are possible," Moree said. People in the nonprofit world say Gates, 50, could fundamentally alter the methodology of philanthropy with his announcement last week that he will quit his day-to-day role at Microsoft Corp. in two years to spend more time on his foundation. He will take the same energy he once directed toward software technology to global health, education and other intractable issues, they say. Even as Microsoft is grappling with a changing competitive environment in which the software that Gates championed is losing ground to Internet-based services, the foundation is facing hurdles that observers say only Gates may be able to clear. The foundation has not been able to carry many of its projects through to completion because of the enormous logistical, political and commercial barriers inherent in distributing malarial vaccine to Africa, for example, and developing a vaccine against HIV and AIDS. Finishing those tasks requires political diplomacy, organizational efficiency, and monetary and human resources -- challenges that Gates may be uniquely positioned to take on as one of the most successful and driven businessmen of the era. "A lot of the corporate foundations were born in the corporate style," but few have had someone of Gates's stature get involved personally in the execution of their programs, said Sharon Oster, director of the Program on Social Enterprise at Yale University. Logistics -- getting vaccines into places such as Rwanda quickly, for example -- will be a large part of what the foundation will need to do, and Gates will probably have to make hard decisions about which worthy causes are more deserving of his money, such as medicines, infrastructure or education, she said. Decisions about operational controls and investment are not new to Gates, Oster said, adding, "There are also more complicated governmental issues, and certainly Microsoft has dealt with those." But this time Gates's enemy isn't another company -- it's disease, mosquitoes, ignorance, political unrest. And vanquishing those requires a different approach to partnership, she said. It will require working with a disparate group of governments, other nonprofit groups and companies that do not answer to him. Vaccines have to be tested in human populations in large numbers. Collecting that data in the impoverished, remote villages where many diseases are common requires manpower, organization and funding. Once a drug is ready for production, it has to be mass produced in a way that allows it to withstand transportation, high temperatures and other environmental factors that can be tough on vaccines. Some countries charge tariffs or are in states of civil unrest that makes it hard to deliver services. The most frustrating problem with vaccine delivery is the lack of political will and social infrastructure in some countries whose people need the medicines, said Adel Mahmoud, incoming chief executive of the Global HIV Vaccine Enterprise, another group sponsored by the Gates Foundation. The pharmaceutical industry also needs a business case to justify such work. By helping to fund drug development and trials for diseases such as malaria, tuberculosis and acute diarrheal disease, which usually affect poorer populations, the Gates Foundation has essentially created a new market for drug companies. GlaxoSmithKline PLC conducted malaria vaccine trials on 2,000 children, and "that trial wouldn't have taken place without the Gates Foundation," said Nils Daulaire, president and chief executive of the Global Health Council, a Gates Foundation grantee and a membership group that advocates for worldwide health-care access. "As lead investors, they're almost like a country in themselves, with their own world aid programs." Now, the challenge will be developing an easy way to manufacture and distribute the vaccines, Daulaire said. "Mr. Gates is someone who has built his entire career and business and world view on the application of technology -- and having the right technology and application of that technology in user-friendly ways," he said. Moree, the director of the Malaria Vaccine Initiative, said that the foundation is impatient for results and that this drives a "private-sector mind-set." Moree meets with officials from the foundation to lay out timelines and goals for the group. The group is focused on speed because 1 million people, mostly children, die every year from malaria. The foundation's money has allowed Moree's group to invest in a number of projects simultaneously, as if planning for further trials even before a first one has finished, she said. "You can do multiple shots on goal" without fear of making mistakes, she said, because the foundation wants an aggressive approach that could allow more products to move through the pipeline. "We're constantly innovating -- better, faster, cheaper is our mantra." As an ambassador for projects, Gates is likely to draw more funding and interest from other corporations, Moree said. "The Gates Foundation is a quality brand. It's something they want to be associated with," she said. "People want to be associated with success." Submitted by Rich_Rodriguez on Mon, 2009-10-26 14:07. In the summer of 2009, Sara Diaz (President of UCD Atheists) and Joel (President of Metro State Atheists) attended the CFI Student Leadership Conference in Amherst, NY in late June. There, we were presented with the launch of CFI’s Campaign for Free Expression by Debbie Goddard and some ideas of events we could do during Banned Books week (September 28-October 3rd) as a part of the Campaign for Free Expression. Dramatically, we looked at each other with that “I know exactly what you’re thinking” look; “Why not do something that will improve our community and advance Freethought?” After some brief, low-volume, excited discussion between the two of us we decided upon giving out banned and Freethought books in exchange for non-perishable food donations to benefit a community food bank. When we got back to Denver, we began work on the event right away by contacting Food Bank of the Rockies, a local food bank that did not have a problem working with an atheist organization. Then came the seemingly daunting task of acquiring the number of books needed to make the event successful. We started by sending out an email to our email list and messaging our members on our Facebook group. We got minimal response from that, a few books donated. A few weeks after beginning this search for book donations we received an email from Tanya Higgins of Boulder, CO who offered to create an Amazon.com wish list on behalf of our group for our cause. She set it up such that people could purchase books and they would be automatically shipped to Sara and Joel’s house, our “headquarters”. About a week later we received our first shipment of books, the sender/buyer was from Canada! From then on nearly every other day on average, we received books from all around the country, including our state of Colorado. The CFI and SSA (Secular Student Alliance) also helped by sending one, large box of freethought books. We would like to thank all donors, both individuals and organizations, for their contribution. The event was also featured in a letter to the editor in Freethought Today, a publication produced by the Freedom from Religion Foundation, by local freethought activism Mike Smith.On the two days of the event, Sept.29th and Oct. 1st, we handed out books proportional to the size, backing of the book and the size of the monetary or non-perishable food donation. All monetary proceeds went directly to purchasing food. Though it is unknown how many books were given away (we still have about 15-20 left), we were able to donate to Food bank of the Rockies 252 items of food! The turnout and subsequent donations were a pleasant surprise to us. We learned a lot from this event for future incarnations of it. Given how successful it was, we will surely be doing it again come next fall! Joel Guttormson is an undergraduate double majoring in Theoretical Mathematics and Linguistics at Metropolitan State College of Denver. 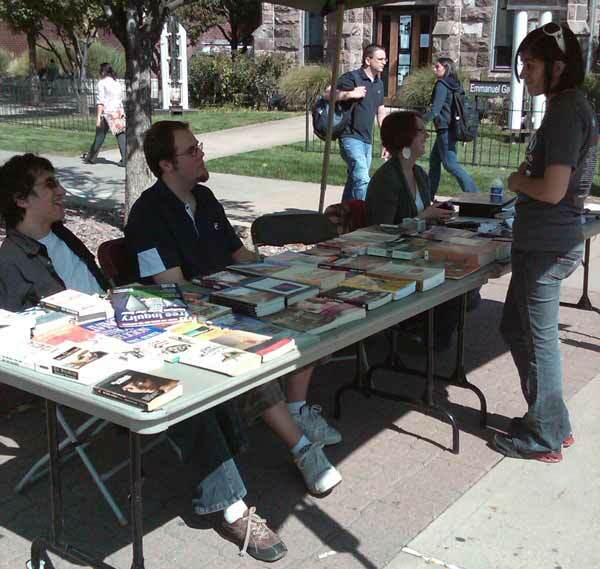 Joel is also President of Metro State Atheists, and a member of the CFI On-Campus Publication and Activism Committees. Sara Diaz is an undergraduate majoring in secondary education-English and minoring in philosophy at University of Colorado Denver, Downtown Campus. Sara is President of UCD Atheists. Submitted by Sapient on Mon, 2009-10-26 01:03. Submitted by aajoeyjo on Sat, 2009-10-17 02:33. If you've ever wondered what happens to nonperishable food that is mislabeled or slightly damaged, some members of the Beltway Atheists can tell you. On Sunday, March 1, 18 members of the Beltway Atheists volunteered at the Capitol Area Food Bank (CAFB) in Washington, DC. The CAFB primarily serves as a distribution center for surplus food, distributing 20 million pounds of food ever year to over 700 partner agencies. While there are many different sources of this bounty of surplus food, some comes from food drives or in enormous bins of slightly damaged packages from grocery stores. All of this food needs special and careful handling before it can be distributed to partner agencies according to their needs. After arriving at the food bank, Beltway Atheists members were shown an orientation video about hunger in the community and given instructions for their task of the day: packaging sorted food items into smaller boxes. For the next three hours, they pored through metal bins that were waist-high and several feet wide in order to neatly pack each box with variety of food in the same category (pasta, pantry goods, canned meats, etc). Boxes were taped shut, labeled with markers, and neatly stacked against the warehouse wall. After the warehouse was swept clean to guard against pests, they were done for the day. It was a fun and social way -- and perhaps more important, a useful way -- to spend a Sunday morning. In the Washington DC Metropolitan Area, 633,000 people are experiencing hunger or are at risk for it. Of these, 200,000 are children. All of us are faced with a choice: we can hope that the world will get better and ask an imaginary friend to make that happen, or we can take actions that have a tangible effect. This past Saturday, the Charitable Works Committee of Beltway Atheists voted to return to the food bank quarterly. This article was written by Michigoose - Co-Chair of the Charitable Works Committee. More information on this event is available here. Submitted by shelley on Wed, 2009-03-18 14:15. Contributing to a Cleaner Environment! Lynchburg Area Secular Humanists have adopted a section of road on Main Street in Lynchburg (parallel to Church Street). Their first clean-up is scheduled for February 22nd! The Charitable Works Committee of Beltway Atheists is also in the process of adopting a section of road in Northern Virginia! Submitted by shelley on Wed, 2009-02-11 23:39.